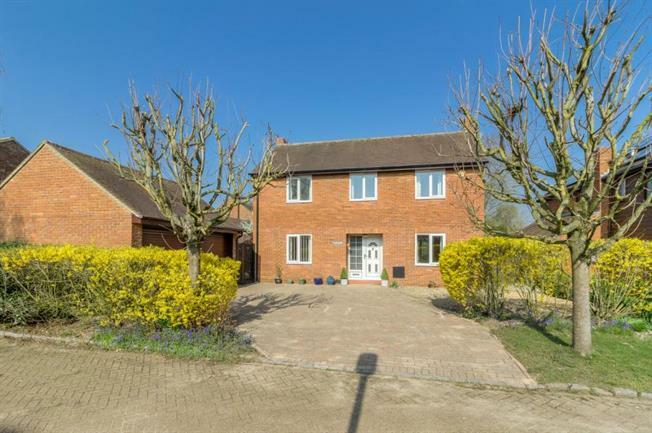 4 Bedroom Detached House For Sale in Milton Keynes for £600,000. Situated in the sought after area of Milton Keynes Village is this well presented, double fronted four bedroom detached home. The village dating back to Saxon times and also appearing in the Doomsday book as Mideltone is tranquil with a variety of walks and close to the array of shops and amenities at Kingston District Centre and a short drive from Waitrose and Centre MK. When entering the property you are greeted to a lovely entrance hall and doors leading to the kitchen and lounge. The kitchen has a range of high and low level units, granite worktops and tiled floor. Integrated are a double oven and induction hob and space in the utility area for the washing machine. The lounge is bright with large window to the front aspect and patio doors leading to the conservatory. Upstairs are four good size bedrooms with an en-suite servicing the master and a family bathroom. Outside is beautifully maintained large rear garden with patio area and laid to lawn with an assortment of trees and shrubs. The front has a private drive with off road parking for three vehicles and a double garage. Within catchment of some of Milton Keynes OUTSTANDING schools and a great commuting links by road this property gives you the best of both worlds with village life and city living. The property in brief comprises: Entrance Hall, cloakroom, lounge, kitchen/diner, utility, conservatory, en-suite to master, double glazing, gas central heating, front and rear garden, double garage.